The Faculty of Law of the Széchenyi István University has been integrated the EU law related subjects into the curriculum in the end of the 1990s, which was partly an outcome of the previous successful PHARE and Jean Monnet-projects led by Professor László Milassin, the coordinator of the current project proposal. The focal point of the EU-related research and teaching activity has always been the Centre for European Studies of the Faculty of Law. As the general language of instruction at the Faculty is Hungarian, the EU law subjects originally have been introduced in Hungarian. However, in the last decade, the students attending the courses of the Faculty are showing growing demand for courses relating to the European Integration and EU law, and the courses announced in foreign languages, principally in English are popular. This increasing demand can be observed at following two levels. On the one hand, the popularity of the EU law subjects among the Faculty’s MA students in law is understandable, because the EU law will be an important factor for the young graduates in all conventional branches of legal professions. They will face the relevancy of EU law in the daily routine, and it is unavoidable that they apply, interpret, or refer to sources of EU law. If the courses are announced in English, it provides the perspective of a double-effect, since the students will have the opportunity to improve their foreign language skills as well, becoming adept in the legal English and in the specific EU law terminology. Therefore significant objective of the Faculty is to equip the students with comprehensive knowledge on the EU law and the most important sources and regulatory fields of the substantive EU law. However, actually the availability of the EU law related courses in English can be characterised as ad-hoc based and especially sporadic, which is mainly palpable in the short of comprehensive and methodologically underpinned structure, as well as the lack of up-to-date and concise course materials. On the other hand, as a second factor, the Faculty has to face the need for the attractive course offer in English in the Erasmus-cooperation as well. The Faculty operates approximately 20 bilateral agreements with foreign Universities, but most of these agreements establish a quite asymmetric relationship with the partner institutions, which means in fact, that the Faculty is able to send cca. 25 outgoing students to the foreign universities, but receives only 4-6 incoming students per academic year. According to the feedback of the incoming students, the most important factor plays major role in the current situation, is that the course offer of the Faculty is unimpressive to the incoming students for the following reasons. The course offer of the Faculty predominantly consists of subjects which reflect on the contextualisation of the Hungarian law and regulation (eg. “Introduction to” courses in English, like Introduction to Hungarian administrative law, to Hungarian Criminal Law, etc.). Although the content of these subjects can be regarded fascinating to foreign students, they do not intend to opt for, because these subjects mean no real opportunity to transfer the acquired ECTS credits by the incoming students to their host institution. In other terms these specific, Hungarian law related courses produce no transferable credits, because of the specificity and the mainly national character of the legal education in Europe. Conversely, the opinion of the incoming Erasmus students has evidently shown, that the most impressive and attractive subjects would be the courses in the field of EU substantive law, knowing that the general character of these courses are common in the European area of higher education, therefore these subjects offer the prospect of the easily transferable ECTS credits to the incoming Erasmus students. In the post-grant period, preparing the accreditation of a post-graduate LL.M. course in EU law in English. promotion of the ‘law in context’ teaching method at the Faculty. 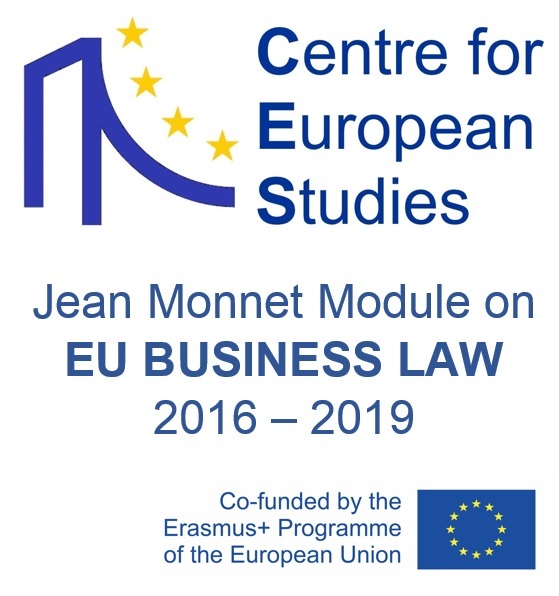 The Jean Monnet Module on EU Business Law composing of two courses ‘EU Business Law 1: Horizontal issues’ (announced in the winter term) and ‘EU Business Law 2: Sectoral and procedural issues’ (announced in the spring term) will be introduced. During the first year of the project the team members commence the elaboration of the draft text of the course book ‘Introduction to EU Business Law’. Also underlying research activities will be conducted by establishing a working paper series and a blogsite on the homepage of the Centre for European Studies. In the second half of the first period the team will organise a workshop on the current challenges of the EU business law. Based on the experiences and feedbacks stemming from the first year of the project, the team members will improve the content, structure and the methodology of the courses and shape out the final form of the Module. The draft text of the course book will be made available as course reader for the students. Their remarks and comments will help to finalise the course book within this workstream. In the third phase of the project the permanent design of the Jean Monnet Module will be integrated into the curriculum. The course book ‘Introduction to EU Business Law’ will be published and subsequently a book launch event will be held. In the second half of the this workstream, a closing workshop will be organised. In addition to the standard teaching methods (participatory teaching, in class discussions etc.) the Jean Monnet Module will predominantly based on the ‘law in context’ approach. The main aim of this method is to offer a perspective behind the text of the law in order to equip students with the ability to understand the real function of these legal instruments governing the business relations within the EU internal market. Specific attention will be paid to the case studies and the analysis of the case law of the Court of Justice of the European Union (CJEU). Post-grant impact: accreditation of a post-graduate course (LL.M.) for professionals. The project is presented by the project team of the Department of Public and Private International Law of the Faculty of Law. The composition of the project team reflects on the fact, that mainly the Department of Public and Private International Law is charged of teaching of EU law related subjects. The project team constitutes a team of specialist with extensive complementary academic and professional experience, which includes both senior and junior members. The team will rely upon also the infrastructure of the Centre for European Studies (research centre of the Faculty established within a former PHARE project in 1998 chaired by Prof. László Milassin). The project is sustainable beyond its final date of execution. The team members, as tenured professors and lecturers of the University, will continue to offer the courses prepared within the proposed project. The knowledge obtained by the team members through this project will contribute to their future academic activities as well, and the elaborated course structure and course materials will well prepare an accreditation procedure of a post-graduate LL.M. course in English. Moreover, the project can be characterised as cost-effective. Expenses are reduced to the essential material costs (acquisition of relevant literature, costs arising from publishing the course book, costs of the planned conference and the book launch workshop), and to the personal costs of the necessary additional work inputs devoted by the project team members (course and course book preparation).